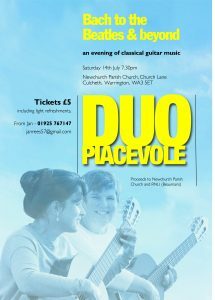 Duo Placevole, formed by Ruth Fielding and Berverly Henry, will present an evening of classical guitar music ‘Bach to the Beatles & beyond’ on Saturday 14th July at 7:30. Tickets including light refreshments are £5. 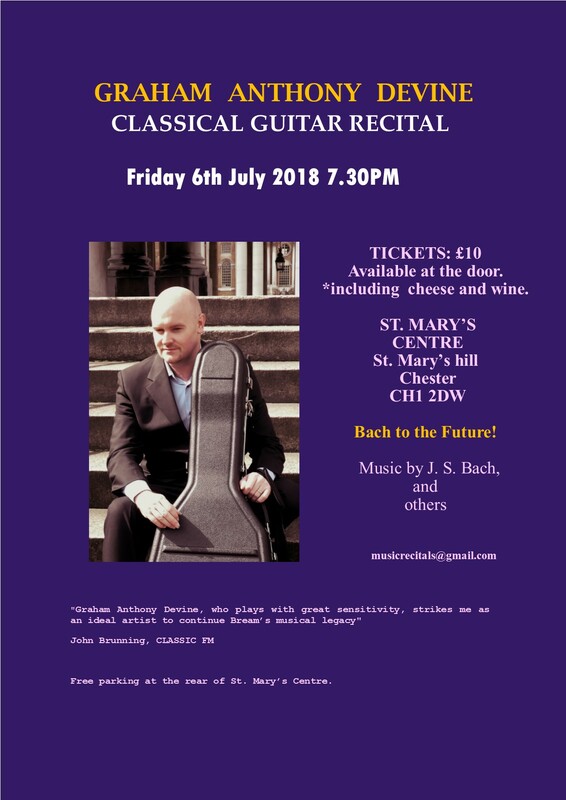 Graham Anthony Devine will be giving a concert on Friday 6th July at 7.30pm at the St Mary’s Centre. He will play pieces by J.S. Bach, Barrios and Giuliani. The entrance is £10 including cheese and wine. In 2002 Graham was the first prize winner at the Alhambra International Guitar Competition held in Alcoy, Spain and at the Emilio Pujol International Guitar Competition, Italy. He is the only English guitarist to win either of these competitions. Graham records for NAXOS and his many CD releases which include the music of J.S. Bach through to South American music and twentieth century repertoire have received rave reviews worldwide. Graham has also made two CDs for the UK based label GGR, they are entitled Appassionata and Burgalesa and were recorded by acclaimed recording engineer and producer, John Taylor. He has performed at many of the world’s leading recital venues such as the Wigmore Hall (London) Purcell Room (London) Palau de la Musica (Valencia) Hakuju Hall (Tokyo) Phoenix Hall (Osaka) etc. Graham is currently Head of Guitar at Trinity Laban Conservatoire of Music and Dance, London. He is also the Artistic Director of the Royal Greenwich Guitar Festival, London, UK.